The first time I saw this top, I couldn’t believe it was a pattern by See Kate Sew. I thought I had seen all of her patterns (if I remember correctly, I bought my first pdf pattern from her Garden Party collection) and would’ve definitely noticed this one. It’s the City Girl Top and Frock, and I love the way it looks on the cover model. I couldn’t wait to sew this one up! 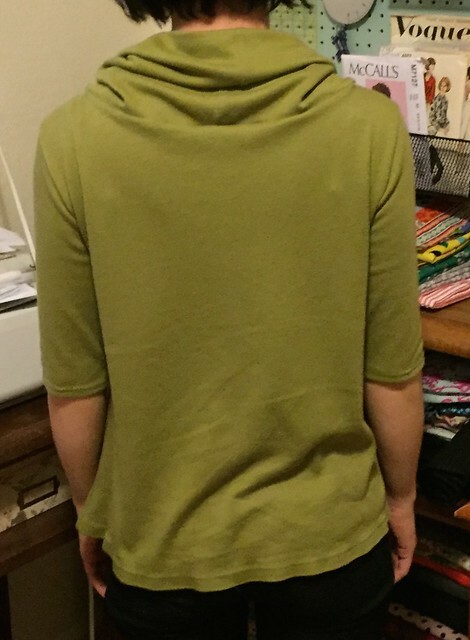 Soooo I guess I cut out the size small in this very soft green knit fabric like back in February, and promptly put it aside. I must’ve been distracted by some other pretty fabric! 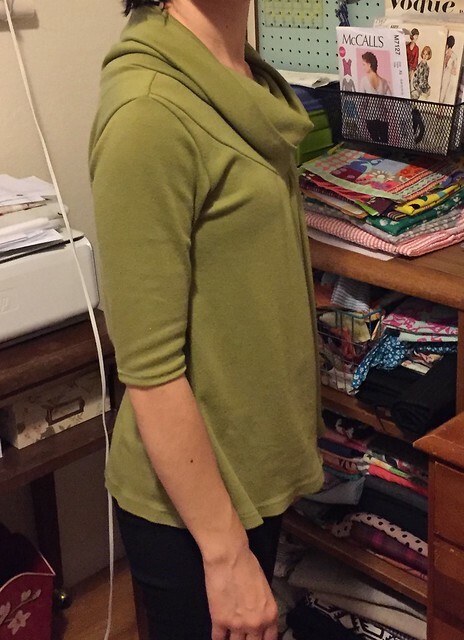 The construction was pretty straightforward though, with a little front gather detail, a yoke, and cowl neckline. There are other options, but these are what I chose for this top. I didn’t top stitch around the neckline though after attaching the cowl. I seem to be going through a not-topstitching-knits thing. I just don’t like the way it looks, but maybe if I were to practice more I would get better and then like it. Maybe I’m just ready to move on by that point in the project, who knows? I do like the way the cowl sits in this fabric, and it pretty much stays when wearing too. No flashing the kiddos in storytime in this one! These pics are at the end of the day, and it looks pretty good still, not stretched out or sloppy looking. I do find that it wants to slide down my shoulders a little, I think because I need to go down a size. I believe when I cut this pattern out I was still nursing my littlest one, so I was a lot bigger then. I’ve been trying out hem tape, and I used it here for the bottom hem. It does give a crisp hem, but I’m not so crazy about the waviness. I didn’t iron this after washing because it’s a knit and doesn’t need to (which is why I LOVE knits! ), but I’m wondering if I will always have to iron the hem while the hem tape lives in the hem (I also hear it kind of disappears after awhile). So far I’m ho-hum on the hem tape. I did get a lot of compliments on this one while wearing it the other day. Mostly, “You made that?”, which is pretty cool to hear. It looks like it takes more effort to make than a simple t-shirt, but it only looks more difficult. 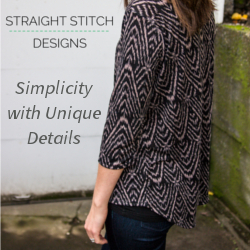 It’s really a simple top to make, and very comfortable, and I’m soooo making more. What about you? 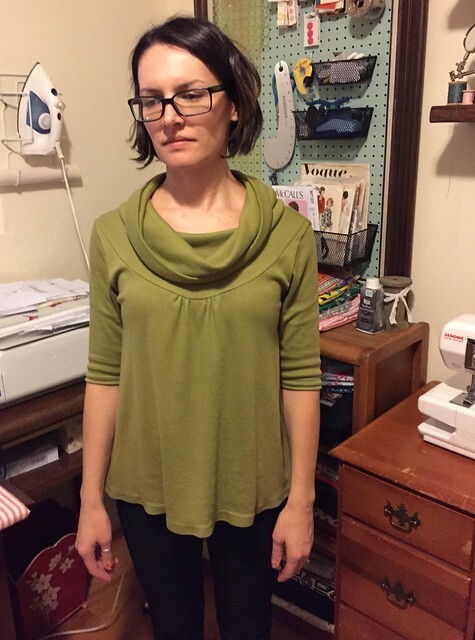 Any comfy fall/winter tops on your cutting table?